Who Does What At The Airport? The Syracuse Hancock International Airport is THE airport for the Central New York Region and beyond. Well over 2 million passengers walk through our terminal on an annual basis. SYR is the gateway connecting people together as passengers come to seek adventure, reunite with family, travel for business, and open new doors for their future. Our new terminal advertising program connects your organization with local, national, and global passengers and their journey to any of our nearly 25 non-stop destinations. We have 55 new advertising locations available throughout the terminal to help you reach your audience. Airports are a highly effective media platform for advertisers. In fact, studies show there is a higher recall rate for products and services advertised at an airport because there is less media clutter and more available “linger” time for the passengers. NEW Reservation Board—Located in Terminal A & Terminal B baggage claim areas, arriving passengers only have to pick up the phone to have instant access to local hotel, restaurants, and other area vendors located on the reservation board. NEW Digital Advertising—Located in Terminal A & Terminal B baggage claim areas, these large screen 4K monitors display your advertisement to passengers and visitors. NEW Wall Wraps—Located throughout the terminal, these wall wraps vary in size and are visible to arriving and departing passengers. There are more than 40 pre-security and post-security locations to choose from. NEW Fabric Backlit—Located throughout the terminal, these bright fabric signs are available in several sizes and illuminate your advertisement to arriving and departing passengers. We pride ourselves on our customer service, with staff members committed to effective communication to find the best advertising fit for your company. 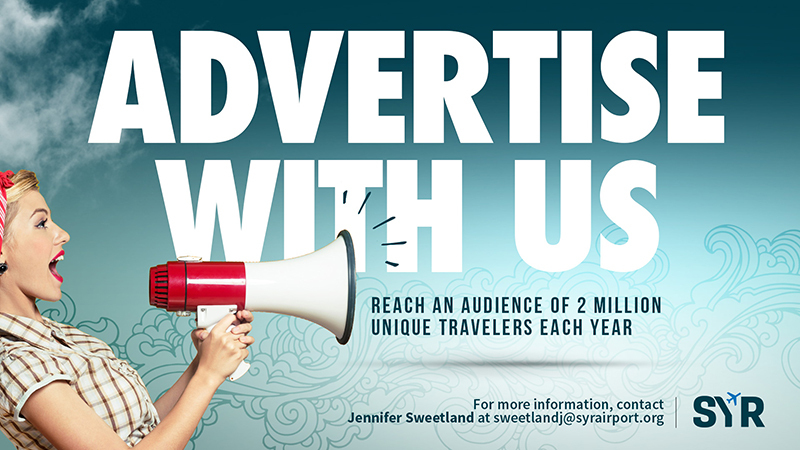 Please contact Jennifer Sweetland, Director of Marketing, Communications and Air Service Development with questions at sweetlandj@syrairport.org or (315) 455-3678.